In the evening of 27 July, we will once again be witness to a Total Lunar Eclipse, when the shadow of the Earth moves across the Moon. The entire eclipse lasts from 10.45 pm on 27 July till 4.59 am on 28 July. We can see the Moon visibly entering the umbra, which is the start of the partial eclipse, at 11.54 pm and it will be fully in our shadow at 1.00 am on 28 July. The Moon will start to leave the Earth's shadow at 2.43 am, and will exit it fully at 3.49 am. The penumbral eclipse will end at 4.59 am. Given the monsoon, thick clouds and even rain will prevent most parts of India from enjoying the eclipse, though some parts will hopefully be clear. So do go out and see if the skies will be cloudless enough for you to see the eclipse. Contrary to popular belief, there are absolutely no harmful effects due to seeing an eclipse. You can eat and drink during the eclipse, and watch it with your friends and family. Do use #EclipseEating to post photos on social media of you and your friends and family eating during the eclipse. 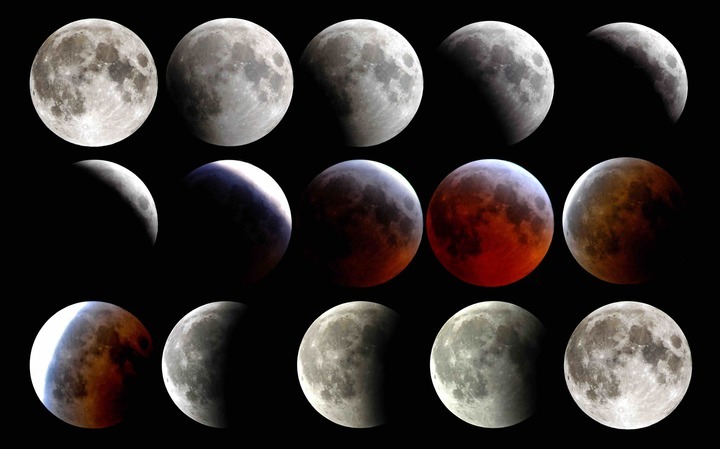 The next lunar eclipse that can be seen from India is a partial one on 16 July 2019, so do catch this one if possible. This is the longest lunar eclipse this century, but not by much - more on that below. You will also see a very bright red object just south of the Moon. This is the planet Mars, which coincidentally happens to be in opposition on 27 July, and will be closest to us on 31 July. The animation on the left shows you how the total lunar eclipse of 27 July 2018 will progress and has been created by Tom Ruen. The timings are in UT (which stand for Universal Time). Please add 5 hrs 30 minutes to the mentioned times to get the corresponding numbers for IST (Indian Standard Time). For example, the mid eclipse is at 20.22 UT, which is 1.52 am. The outer white circle marks the boundary of the penumbra of the Earth’s shadow and the inner white circle is its umbra. When the Moon is inside the penumbra, its light is indeed dimmer, but this dimming is difficult to notice without careful attention. However, when the Moon enters the umbra, the covered part will be dark and will be readily apparent to the naked eye. When the Moon is fully within the umbra, it is usually reddish in colour, which is due to the light refracted through the atmosphere of the edge of the Earth. Note that the Moon passes almost exactly through the centre of the umbra. This is one of the reasons why this is the longest lunar eclipse to occur this century. A very useful page with timings and images about the eclipse. They also have a page on every single eclipse! Find a good location beforehand, maybe a couple of days prior to 27 July, where you can have a clear unobstructed view of the sky. The Moon will be high in the sky when it enters the umbra but will be near the western horizon near the end of the eclipse. Make sure that there are no very bright lights nearby, so that the fully eclipsed Moon will be beautiful and bright. If you are hosting a public event, you may want to ensure that there is plenty of space for people to move around safely. Though it will be cloudy from most parts of India, you can still enjoy the eclipse if the clouds are in motion, with periods of clear skies, or even if there is a very thin cloud cover. So do go out and check every once in a while throughout the night. Just follow the Moon as it gets eclipsed in the sky. The penumbral eclipse will not be spectacular, and you may not even be able to see a difference unless you look carefully. However, the umbral eclipse is obvious, where you can see the circular shadow of the Earth progressively cover the Moon. So, you can see the eclipse with your naked eyes or using a telescope and you can eat during the eclipse. In short, there are no harmful effects from seeing the eclipse on 27 July. An eclipse is one of the most grand and awe-inspiring spectacles that nature has to offer us. Why would we not want to see it? Is this the longest eclipse this century? The Total Lunar Eclipse on 27 July 2018 will be the longest this century. Specifically, the duration of totality, when the Moon is completely inside the umbra of the Earth's shadow, is the longest this century (reckoned from 2001 to 2100). This duration is 104 minutes long. This is due to two reasons. First, the size of the Earth's umbral shadow at the distance of the Moon, during Full Moon, is more than 2.5 times the size of the Moon itself. Hence, depending on the particular path that the Moon takes during an eclipse, it can pass at different distances from the centre of the umbra. It is easy to convince ourselves that closer to the umbral shadow the Moon passes, longer is its path inside the umbra, and longer is the eclipse. Second, the orbit of the Moon around the Earth is not a perfect circle, but is an ellipse. This means that the distance between us and the Moon varies along its orbit, from as close as 3,62,600 km (perigee) to as far as 4,05,400 km (apogee). This means that the size of the Moon in the sky also varies along its orbit. If an eclipse occurs when the Moon is farther from us, its angular size will be less, and hence will take longer to pass across our umbra, leading to a longer eclipse. Now, the eclipse on 27 July 2018 occurs near apogee and in addition, the Moon passes extremely close to the umbral centre. These two factors make this eclipse longer than usual. However, it is not much longer than other total lunar eclipses this century. Its duration of 104 mins is close to that of 15 June 2011 (100 mins), 26 June 2029 (102 mins) or 7 Aug 2036 (96 mins). What is the bright object near the Moon? You may notice a bright red object just south of the Moon on the night of the eclipse. This is the planet Mars! Mars, Earth and the Sun can line up in two ways, with the Earth in the middle, or with the Sun in the middle. The former is called the Opposition of Mars, and this is when the distance between Mars and Earth is the smallest. Hence, oppositions are when Mars appears biggest and brightest. Such an opposition occurs, coincidentally, on 27 July, during the eclipse. Since a lunar eclipse also occurs when the Earth is almost exactly in between the Moon and the Sun, we can see Mars and the Moon very close together on this night. 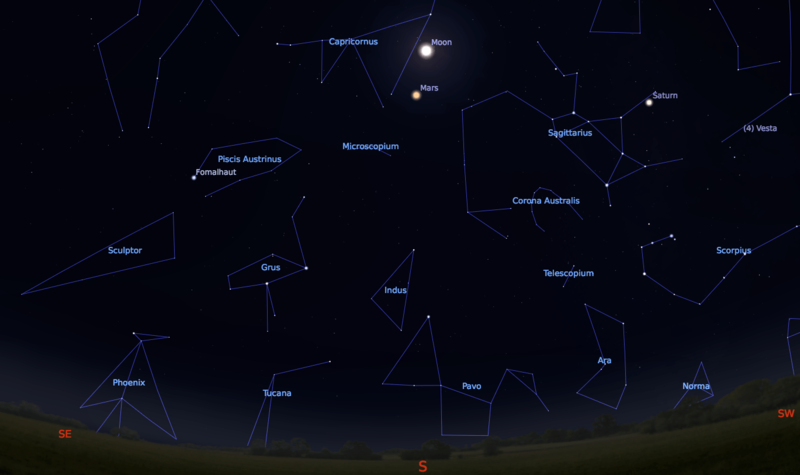 A very red Mars will be only 6 degrees south of a very red eclipsed Moon, as can be seen in the image above! Mars will actually be closest to us since 15 years on 31 July, four days after opposition. This curious fact is because the orbits of Mars and Earth around the Sun are ellipses, and not perfect circles. This is the reason for this difference of 4 days. In addition, this ellipticity, along with the non-zero angle between the two orbits, also ensure that the distance between Mars and Earth is not exactly the same every opposition. This is why 27 July is special!